How did you see in the New Year? We spent it visiting with family in a beautiful mountain home in New Hampshire. As a gift to our dear friend and the home owner I decided to try and use my new Silhouette to make a moose. She collects them and her home is filled with arty moose. I added this one along with the trees. the moose stands about 3" tall. I didn't see any moose while out cross-country skiing but did have a wonderful celebration! And I continue to love my new Silhouette! Update: The patterns for this project are now available at the Silhouette Online Store here. I love all of your artwork and really enjoy reading your blog. 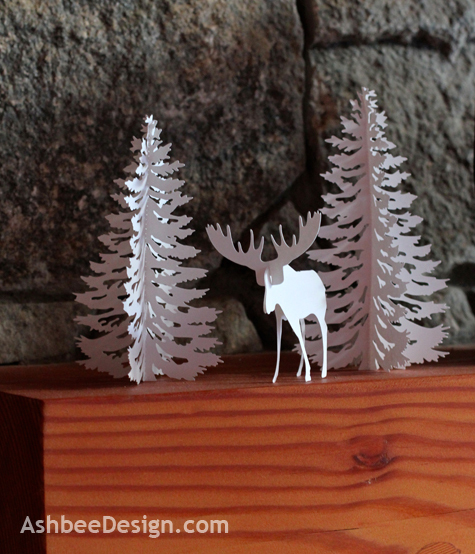 The moose and trees are great! Is the tree a file in the Silhouette store? I can't seem to find it but would love to buy it. Thanks for sharing all your great work. Deb, I created the tree myself. I got a photo of a silhouette of a pine tree online, saved it as pdf, imported it into iDraw and started modifying. I used the shape as a guideline but then created a better tree for cutting. I thickened skinny areas and removed some of the detail plus added all the interior cuts that give the appearance of snow. I did the moose the same way, downloaded it from and online silhouette, imported it into iDraw and modified it. I took the antlers off the original and made a separate shape for the antlers. The mistake I made was to duplicate the body but left all four legs on it. With two halves I ended up with a moose with 8 legs! We all had a good laugh about it. I then modified each half to only have 2. Is there a way to sell one's Silhouette plans on the site? I haven't explored that yet. Maybe I'll look into it today! Oh! It's so cute! Congratulations! I soooo LOVE the moose and the trees!! I want some!